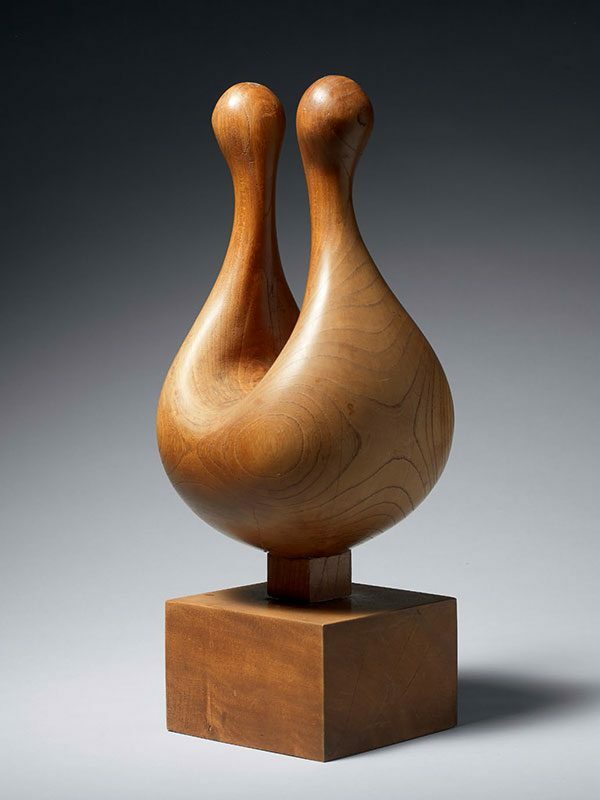 An abstract wood sculpture, made as two rounded finials rising up from a solid body. The grain of the wood is prominent and the patina is smooth. The sculpture is inscribed on the base in ink: Nakamura Junko, sakuhin-mei: sora (Nakamura Junko, the title of the work SKY, made in 1979) and is stamped with the red seal Junko-saku (made by Junko). The sculptor Nakamura Junko was born in 1951, Gifu City, Gifu prefecture. She graduated with an MA degree in fine art from the Tama Art University, Tokyo. She exhibited several times at the Nika-ten exhibition, first in the so-called ‘newcomer artists’ section in 1974. Her works are shown abroad: New York, Los Angeles and Hawaii, Milan, Barcelona and Sydney.